Acne is one of the most common skin conditions and can be suffered by men and women of all ages. Acne is often seen on individuals in their late teens and early twenties but severe cases can last well into adulthood. Acne can appear on the face, neck, back and chest and acne treatment is available to reduce its visibility and lessen its appearance. Contact the UK’s experts in acne treatments. With over 20 years experience, we are the UK’s leading clinic for the best available treatments for acne. Acne is skin condition usually comprising of blackheads, whiteheads and different types of spots. It is caused by the combination of sebaceous glands producing an excess of oil and dead skin cells not shedding; this causes follicles to build up and acne can occur. There are different types of acne and sometimes the affected area can become painful. The symptoms of acne include; oily skin, spots, blackheads, whiteheads, pimples and scars. 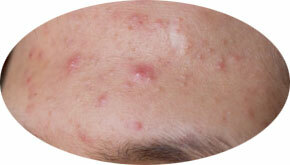 Acne is diagnosed by the appearance of the spots and where they are situated. Laser treatment for acne works by targeting the bacteria that causes the problem. The light from the laser is beamed onto the affected area, without causing damage to surrounding skin tissue. This type of acne treatment is popular as it is a non-invasive and quick procedure. What acne treatments are required? The number of acne treatments required depends on the severity of the condition and your skin type; while some people may only require a few laser treatments others may need more. After several treatments the appearance of the acne will improve and the visibility of the condition will lessen. Who will perform the acne treatment? The acne treatment is performed by one of our qualified practitioners and supervised by Doctor Maria Gonzalez. With an initial consultation we can advise you on the number of treatments required and the possible results. Zap that zit: what's the most effective acne treatment?